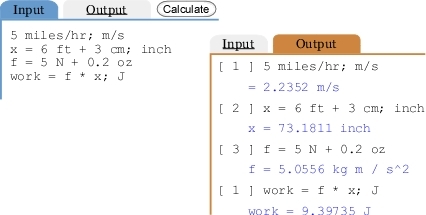 DimensionEngine is the only online calculator with automatic unit conversions. For help, see the DIRECTIONS below or click on the EXAMPLES tab or try either of the QuickStart guides. Find the DimensionEngine calculator useful? Consider supporting us so that we can maintain and improve it! Navigate with the INPUT and OUTPUT tabs below, not the Browser forward and back buttons. Enter one or more input units on separate lines. To convert units, follow the input with a semicolon and the units you want. Assign variables with = and use them in equations. Errors? Edit INPUT and Re-submit. Experienced Users: Click to hide instructions. © DimensionEngine 2015. For questions or bug reports, email us.